So, you’re going on a hut trip. 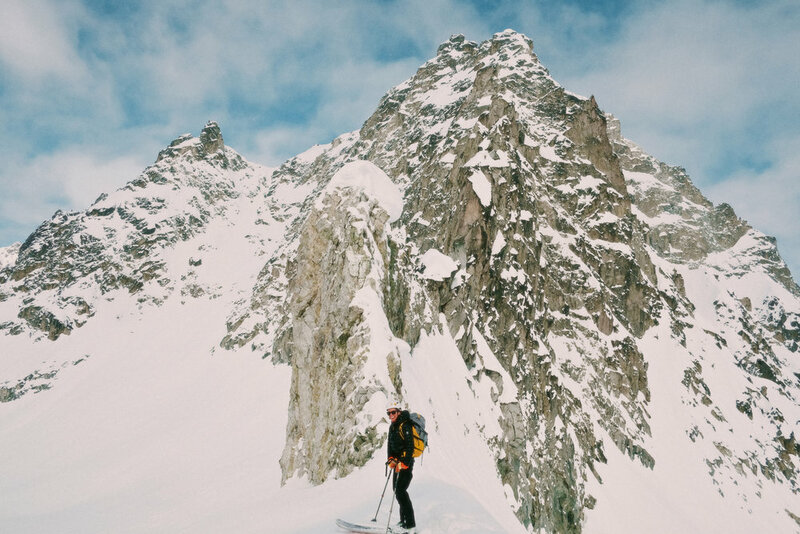 You’ve been promised the backcountry ski lines of your dreams, incredible views, and a roof over your head. If you’re lucky, you’ve got a week to spend exploring untouched powder, away from the masses, in some incredible locale. Or, if you’re like me, you’ve just got four days off work. Two of them will be spent driving, approaching, and traversing out. That leaves two days for what you really came for: the skiing. But what if a storm rolls in? If you’re at a forest service hut or backcountry Yurt in Montana, you go ski trees. Fun! 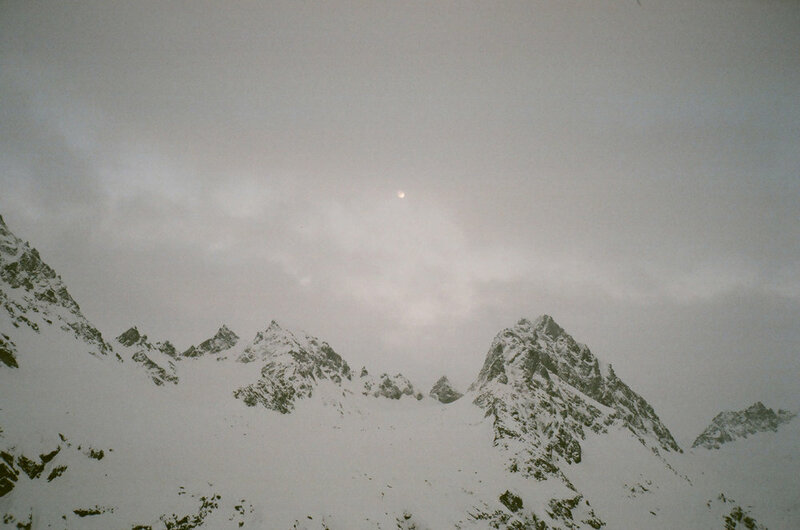 If you’re way above treeline in Alaska, you might be S.O.L. Taylor and I found ourselves in this exact predicament a few weeks ago at Hatcher Pass. Having dreamed of completing the Bomber Traverse on skis for years, we took advantage of a good-looking weather window, stable avalanche conditions, and some weekdays off, and headed for the Talkeetna Mountains. As any smart skier knows, weather reports are subject to being dead wrong. After a bluebird 9- mile approach, we watched a storm build behind us in the afternoon, and overtake us right as we reached the Mint Hut. Optimistic that the next day would bring clearer weather, we expected to proceed on with the traverse as planned. But the weather had other plans. A bluebird day for our 9-mile approach! Not bluebird, but not bad upon arrival at the Mint Hut. ...this, you're in a true white-out. Taylor finds some amusement in the Mint Hut Log. If you were smart, you brought something to read. It’s a hut trip after all. You didn’t have to pack a tent, so you might as well shove a little paperback in that fast-and-light pack of yours! If not, Hut Logs prove to be pretty entertaining. The Mint Hut logbook dates back to the early 90‘s. If read from cover-to-cover, it provides ample information as to where to locate secret mythical hot springs, how much whiskey has been consumed over the history of the Mint Hut, and the number of dogs that have completed the Bomber Traverse. Fascinating! Some entries remind you to be thankful that you’ve got the hut to yourselves. More interesting posts detail climbing routes and clever trip reports. In addition to the Hut Log, Taylor and I were happy to have brought along Mike and Andy’s Glacier Mountaineering Book. Practicing knots and discussing glacier travel strategy helped to pass the time after the Hut Log was exhausted. If you can manage it, get outside and walk around on your skis for a little bit. The light may be too flat to really ski, and the visibility may be too limited to wander far from home, but your body will thank you for some exercise and fresh air. Taylor and I were lucky enough to have the weather begin to lift shortly before sunset, and on our walkabout we managed to rip skins and make a few turns. Taylor is creative and persistent enough to find fun places to drop in, even if only for a second. Tay finds lines close to home. Maybe the weather does more than keep you inside for a day: it may re-route your whole trip. For us, leaving the Mint Hut and pushing on towards the Bomber Hut would have meant a 1700’ skin up a 35-degree slope. Not ideal after 12 inches of snow falling in 12 hours. Thus, a plan change was imperative. Embracing Plan B isn’t always easy, but be smart and remain flexible: weather is a force to be reckoned with. Though we didn’t get to complete the Bomber Traverse, our flexibility allowed us to explore some new terrain and end up having the best ski day of our lives. We were thankful that we didn’t try to push on through possibly sketchy conditions, and instead got to spend a day lapping fresh, untouched powder on an incredibly scenic glacier. Scouting lines and consulting the map at the Mint Glacier. Our flexibility and preparation allowed us to have a pretty incredible Plan B! Plan B had us touring to Grizzly Pass- a most spectacular place and welcome consolation! 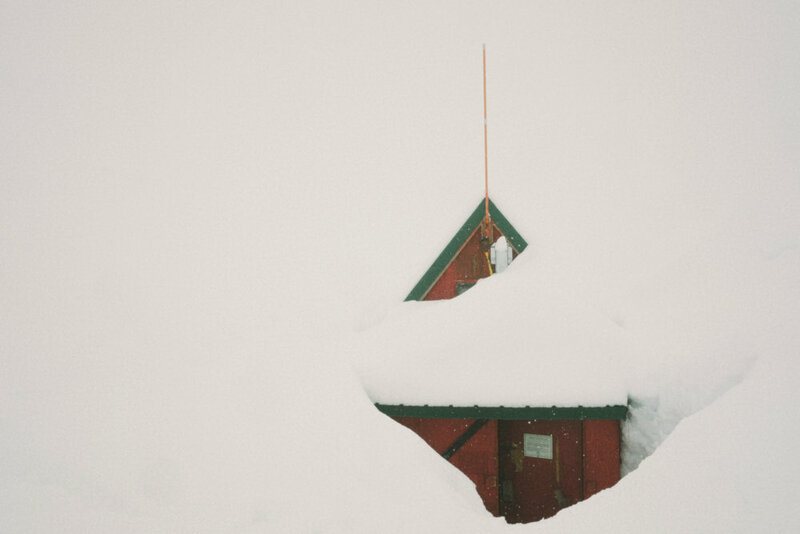 So, you’re snowed in. I’m sorry to state the obvious, but that means IT’S SNOWING! Sure, you might be stuck inside a hut for a day. If you’re lucky, this storm day will be followed by a day of better weather, and then you’ll be skiing powder that was non-existent yesterday. 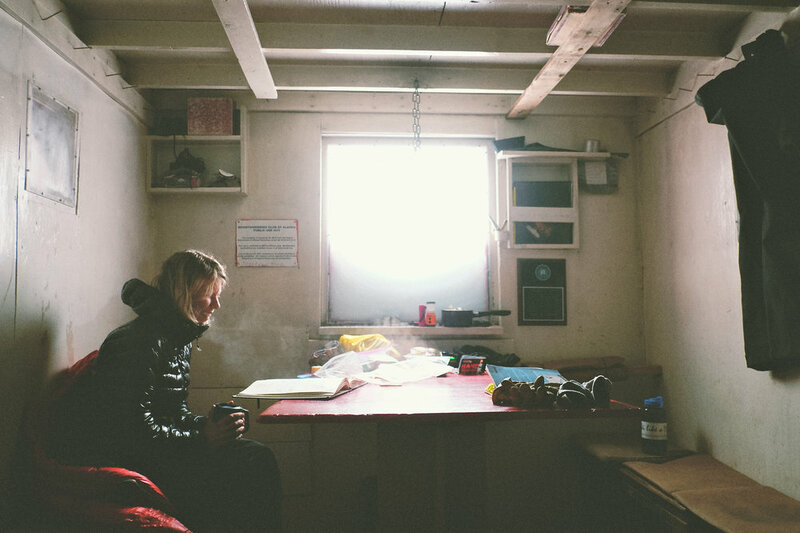 If you’re not so lucky, you might be stuck inside the hut for your whole trip. But that foot or more of fresh that’s coming down means a deeper snowpack, which means longer ski season, which means... you win some, you lose some. So don’t boo-hoo the snow, be glad that it’s still falling. Rather than get caught up in what you might be missing, remember that there will be more ski days in your future. Embrace the forces of nature that are stronger and more important than we are, and be glad that it’s snow out there, not rain. Taylor and I were some of the lucky ones: a perfect day followed our storm day. We managed to stave off any disappointment for not completing the traverse, and instead embraced an incredible day of skiing perfect, light, fluffy, fresh powder on the Mint Glacier. Lapping from Grizzly Pass down to the glacier repeatedly, our faces were sore from smiling. A day spent cooped up in the Mint Hut was more than easily worth the day that resulted from it. Such is life in the mountains: unpredictable. You win some, you lose some, and you can never know before you go. All smiles on a powder day in the Talkeetnas!